The dollar fell to a record low against the euro last month and a 25-year low against the British pound following news that US economic growth in the first quarter was the weakest in four years. US gross domestic product, hurt by a slump in the housing market, increased at a slower-than-expected 1.3% annual rate in the first three months of 2007. Analysts say the prospects for continued weak US growth and improving European growth, as well as still-rising interest rates in the eurozone, are the main reasons the dollar has hit the skids. A move by emerging market central banks to shift reserves from the dollar into the British pound and the Japanese yen could help to keep the dollar on a downward course. The dollar is not uniformly cheap, says Binky Chadha, global head of macroeconomic foreign exchange research at Deutsche Bank in New York. The dollar is very expensive against the Japanese yen, he notes. “Thus, the effects of a cheaper dollar on trade and capital flows are likely to be more muted and drawn out as compared to past episodes,” he explains. The dollar still has further room to decline if fundamental economic factors warrant, he says, adding that when it is adjusted for inflation, the dollar is well above previous lows. “On a trade-weighted basis the dollar has further to fall over the medium term, and we maintain our forecast of another 8% decline over the next two years,” Chadha says. The weakness of the dollar has been driven in part by the rotation of economic growth away from the United States toward Europe, Japan and the emerging markets, and in part by the diversification of emerging market central bank foreign exchange reserves away from the dollar, he says. The yen could be a major beneficiary in this round of reserve diversification, he adds. Marc Chandler, global head of currency strategy at Brown Brothers Harriman in New York, says the “record” low set recently by the dollar against the euro is not as significant as it may sound because the record books go back only to 1999, when the euro was introduced as a trading currency. Euro coins and bank notes were not introduced until three years later. “If we take the high of the old deutschemark and convert it into euros, it would correspond to about $1.45 for the euro,” Chandler says. “A retest of this level is possible, but at this juncture it would seem to require a further deterioration of the US economy,” he says. Instead, a more modest target of $1.40 seems more likely in the coming period, he adds. “This probably means that [the pound] sterling can rise toward $2.06 before everything is said and done,” he says. While the euro has some positive fundamental forces supporting it, such as rising interest rates and improving productivity and output in Europe, it does have some blemishes. Chandler says a downturn in Spain’s housing market and a labor dispute in Germany are two immediate sources of concern in the eurozone. So far, however, these headwinds are not sufficient to overwhelm the positives for the single currency. Economists have been warning of a bubble in Spain’s housing market for some time, Chandler notes. The country’s house prices have doubled since 2000. Recently, the rate of price increases has slowed, and some housing-related equities have declined, but Spain’s economy is continuing to expand at an impressive pace above 3%, he says. Germany was in the midst of an important labor dispute last month. IG Metall staged a series of “warning strikes” to try to force management to increase its offer of a 2.5% wage increase. The higher the wage settlement, the more likely the European Central Bank’s rate-hike cycle will be extended, Chandler says, as the ECB is worried that excessive pay increases may fuel inflation. Meanwhile, pessimism about the US economy may be exaggerated, Chandler says. For starters, the preliminary estimate of first-quarter gross domestic product in the US is likely to be revised upward. “Consumption remains the bulwark of the US economy,” he says. “In the face of six quarterly declines in residential investment, US consumers hardly have batted an eyelash.” Consumption rose 3.8% at an annual rate in the first quarter. The Institute for Supply Management’s manufacturing index rose to 54.7 in April from 50.9 in March. New orders and production improved significantly, as did employment. On the other side of the globe, the People’s Bank of China raised its commercial banks’ reserve requirements by 50 basis points to 11% effective May 15. This was the seventh increase in 11 months, as the central bank seeks to keep China’s economy from overheating. Growth in gross domestic product was 11.1% at an annual rate in the first quarter. China’s international reserves rose by $136 billion in the first quarter to $1.2 trillion. 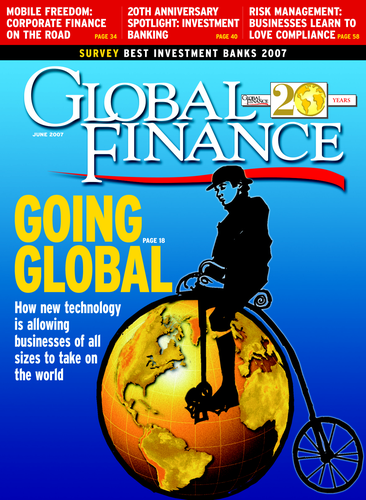 “We are guessing that financial capital inflows—hot money, offshore lending and other monetary activities—have multiplied in size as offshore investors seek ways to participate in China’s explosive economic growth,” says Carl Weinberg, chief economist at Valhalla, New York-based High Frequency Economics. While interest rates in China are not exceptional, Weinberg says, the rates of return realized by investors in real assets—properties, factories and new businesses—are very high compared to opportunities in the rest of the world. “As long as China continues to grow around 10% per year, foreigners will want to put money into assets based in China,” he says. Hot-money flows and a growing trade surplus are boosting China’s monetary reserves, which in turn are boosting growth of the money supply, according to Weinberg. This monetary growth is occurring despite the central bank’s interest-rate increases and rising bank reserve requirements, as financial capital flows into China fairly freely. Meanwhile, food production is not keeping pace with demand, and rising food prices are triggering inflation pressures in the economy, he says. While China’s central bank should be praised for attempting to run a tight monetary policy in the face of upward pressure on prices and growth in the money supply, Weinberg says, it is largely shooting in the dark. The vast majority of China’s people and countless businesses have no bank debt and thus won’t be affected one bit by credit restriction, he explains.